Alternatively, open the Email message and ‘Copy to SharePoint’ is available in the ribbon of the mail message. Click the ‘Send and File’ button. The email is sent and the ‘Save to SharePoint’ window opens to select the location where the outgoing email messages can be saved. 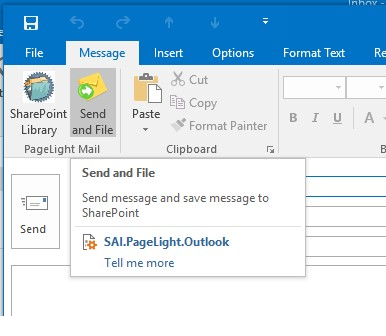 PageLight options can be configured so that users can be prompted to save the Outgoing messages to SharePoint. Click the standard Outlook Send button. Email will be sent and based on PageLight configuration SharePoint location window will be displayed to select the destination. SharePoint contents can be viewed, previewed, printed and other DMS actions can be executed from Outlook. PageLight folders represent a unique SharePoint document library location. 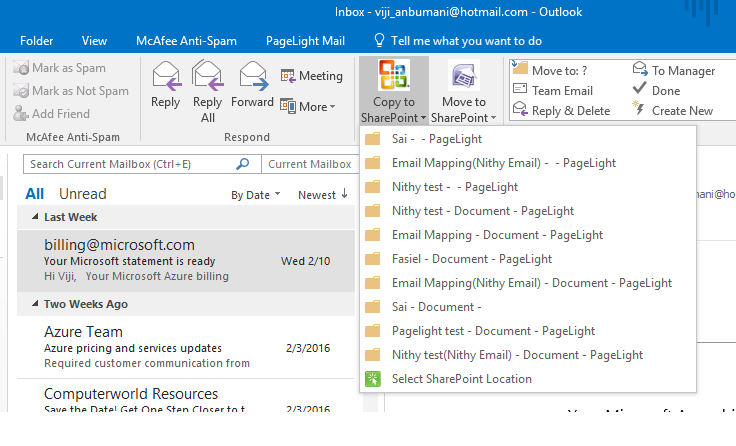 Click the PageLight folder and the SharePoint contents are displayed in Outlook. SharePoint views for the document library are also available in Outlook. Data can be filtered and searched. The files can be previewed or saved locally.